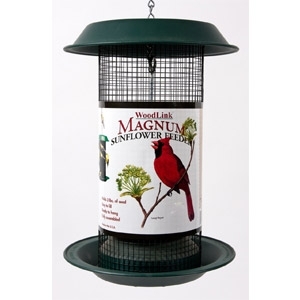 Magnum Sunflower Seed Bird Feeder is a durable and weather resistant feeder that allows clinging birds to feed either by perching on the feeder tray or clinging to the 1/4" vinyl coated wire mesh tube. The tube holds a generous 4 quarts of mixed seed, cracked corn, peanut pieces, safflower or sunflower seeds and features an internal seed baffle that makes sure the feeder is emptied completely and the birds can reach every seed. The feeder tray's drainage holes will help keep seed and the feeder's roof slides up the hanging chain (included).